Welcome back to the last day of a 3-day EV-tour across 6 passes and 3 countries. In the last entry we made it to the duty-free haven of Livigno. The elderly hotel owner who had gladly let us charge over night had called some of her family over to see us off personally. 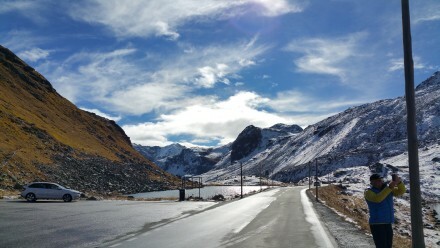 Livigno is located in a high-lying valley with one road leading to Italy and two to Switzerland. After checking road conditions we decided against the Bernina pass and (much narrower and notoriously closed at a minutes’ notice) Forcola di Livigno road and head towards the Passo di Fuorn and beautiful Engadin valley. 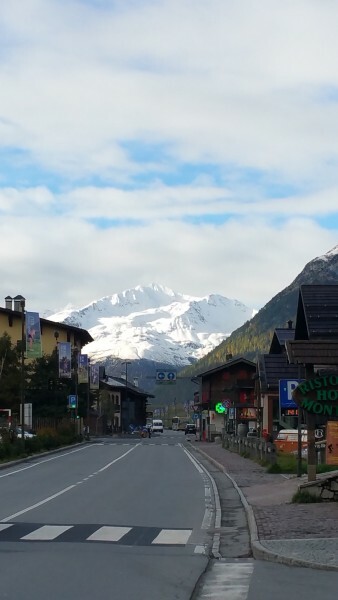 On our first few metres, we are greeted by an impressive view of Swiss mountains and a hint of sunshine – we’re both hoping for more of this! 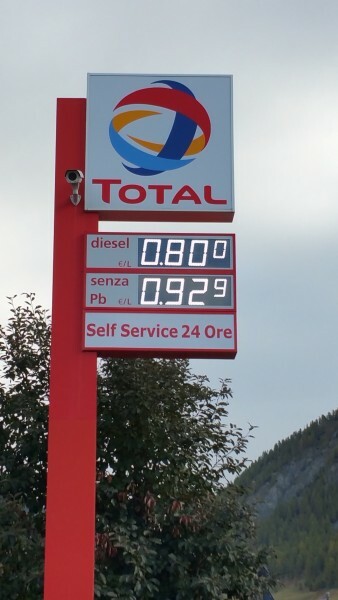 On our way out of Livigno, we come across some duty-free shops and fuel stations – given the huge price difference on fuel (current price of Diesel in Switzerland ~€1.45 / $1.65 per litre) it is understandable that truck and bus drivers just drive up here to fill up – even if the drive to Livigno is either via a €15 toll road or 2 mountain passes! 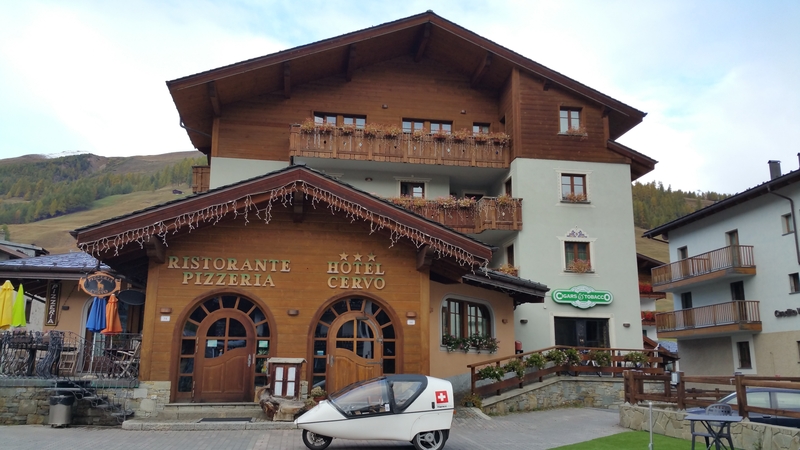 That said, Livigno is much, much better than Andorra la veilla, which JC and I visited on our TWIKE-tour to southern Spain in 2012. 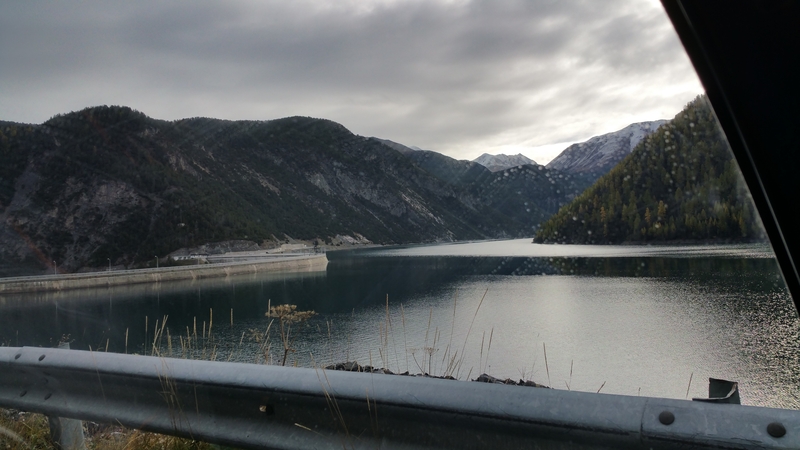 At the end of Livigno village, we’re greeted by Lago di Livigno an artificial lake with a massive hydro-electric arch dam at its end. Just a few minutes later we arrive at the border. Halfway though the dam, a small toll station charges an extortionate CHF 16 (2*8 CHF for two motorbikes – and whilst this price is still cheaper than a car you don’t want to argue for too long because the woman behind the counter has the authority to send you back to Italy…) for our passage to the other side… or so we thought. Just a few metres after the dam we find ourselves in front of a red light and the entrance to a tunnel for about 15 minutes. Why would we have to wait for such a long time? It’s a very narrow single lane tunnel – two TWIKE’s would’t be able to cross. At just under 4 km length it takes us around 6 minutes to get to the other end. Arriving in Susch, starting point of the Flüela pass, we have to decide either to load TW560 on the Vereina railway line or drive up the Flüela (again). 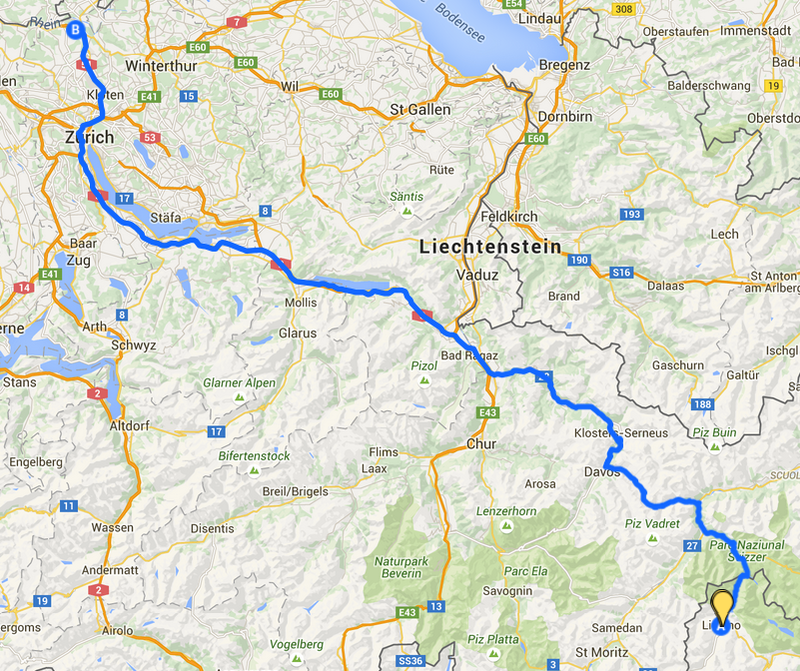 This side of the pass is moderately steep and takes us along a valley deep into the Swiss Alps. Views get better and better – so does also the weather. Above 1800m we leave the trees behind us for the 6th time on our trip – we both marvel at the sheer beauty and ruggedness of the landscapes around us. Nearly at the top we finally leave all clouds behind us and drive into an even more surreal environment. With the warm light of an autumn sun and an extremely clear view everything starts looking near-artificial…like looking at a 2’000’000″ 4’000k TV with an overy exited sharpening algorithm at work. 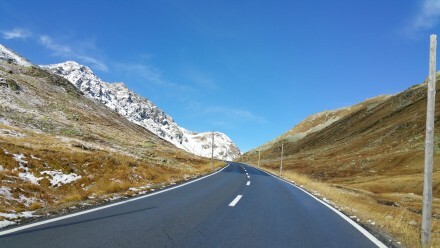 Just a few 100 metres later, we make it to the pass. And stop for a coffee and a local speciality: Bündner Nusstorte. Looking back towards the Engadin, we squint in the sun and marvel at the view – it’s easy to be humbled by such beauty. 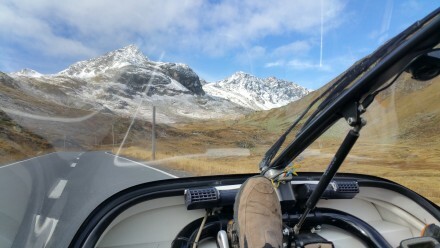 Oliver, yet again, attaches some cameras to TW560 before we head towards Davos. If you want to see extremely beautiful views coupled with maximum efficiency/recuperation and g-force optimized driving: Then the following video is for you! At the end of this very nice drive down the Flüela, we drive past the soon-to-be closed Pischa ski region (fond memories – I used to ski a lot here when I was younger) and the Davos Intercontinental. Creating lots of local controversy when it was proposed, I am still torn between a big Wow (just wait until you get to see it from inside!) 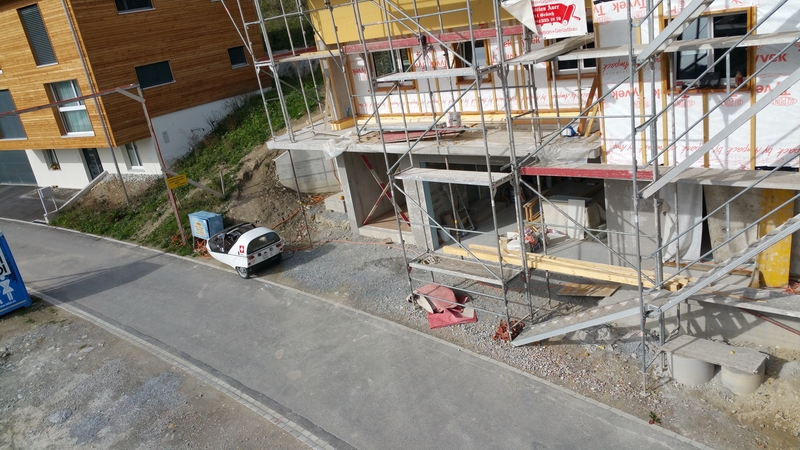 and calling it a monstrosity – have a look at the local architecture in the left hand corner for comparison! 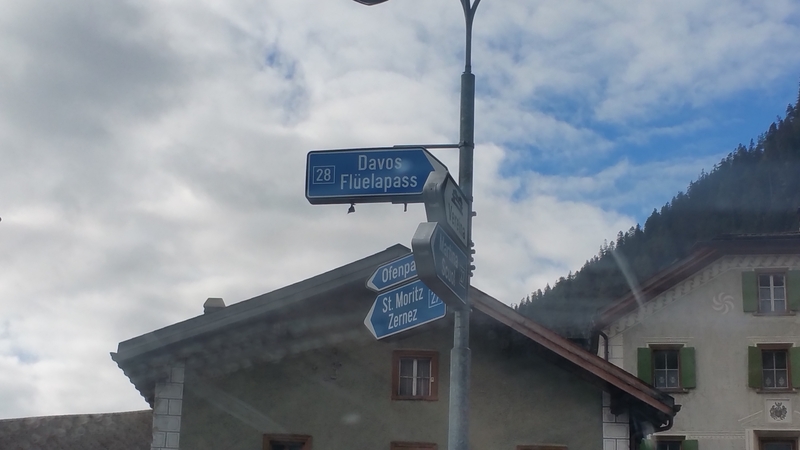 We could have stopped for a drink in Davos but didn’t feel like it and continued our drive down the Prättigau valley past an other well-known ski resort: Klosters. 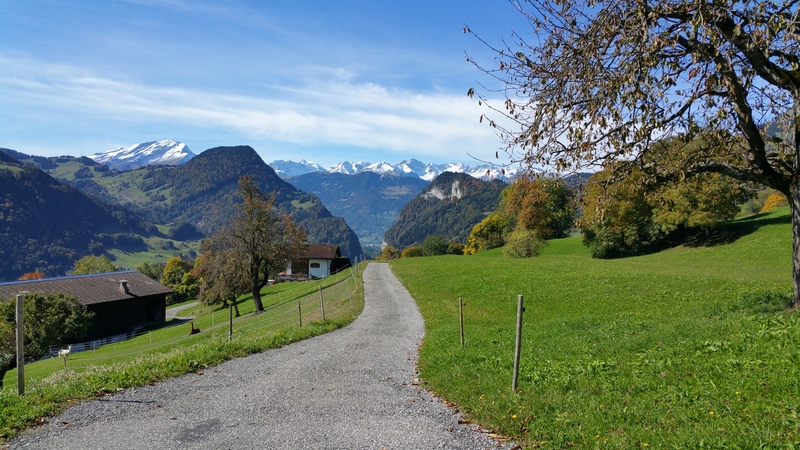 Towards the end of the valley, I don’t feel like driving along the main road anymore – we randomly choose a very small single lane road, leave the valley behind us and just marvel at the views of the lower Prättigau valley. 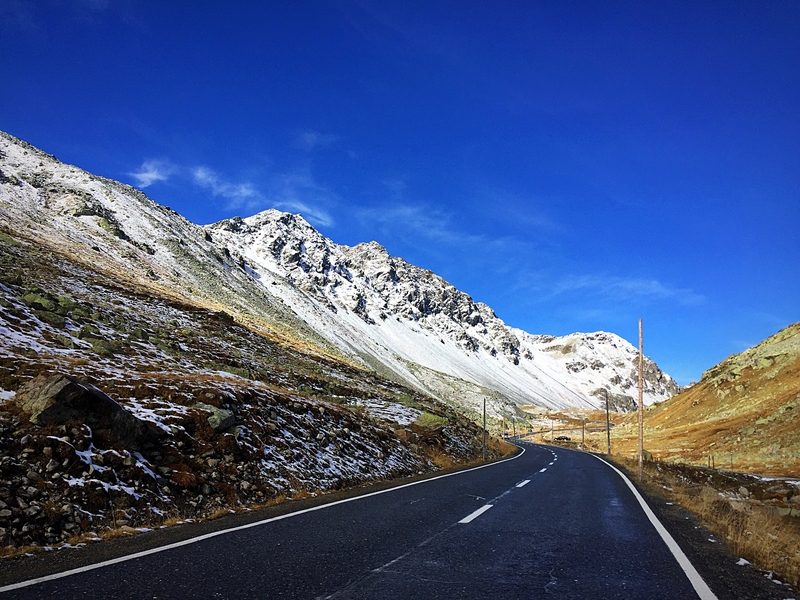 Our spur-of the moment decision takes us along increasingly perfect small roads, past fairy-tale like mountain farms with grazing cows on deep green slopes. Must-see-to-believe! Single-lane roads – our passion. Today: perfection! A little further up the road a hay transporter and the local post bus block the road – both the farmer and the bus driver look very relaxed and both smile when we arrive. Oliver and I get out and tell them that we’re not in a hurry and we are happy to spend more time in such a nice place … and that we are interested to hear from them about the nice things that are waiting for us higher up. 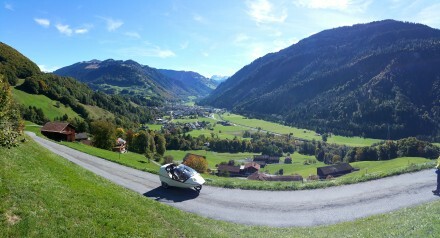 After another 10 minutes of TWIKE-talk the farmer had somewhere to be and we bade our farewells. Oliver and I had heard enough to absolutely want to go to Alp Sassauna! So off we went in search of the cable car the farmer and post bus driver were talking about! 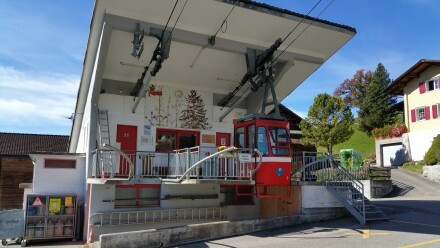 Oliver called the mobile number of the cable car operator. Only to be informed by him that he was currently on his lunch break and that we would have to wait until 1pm – when his shift starts again. 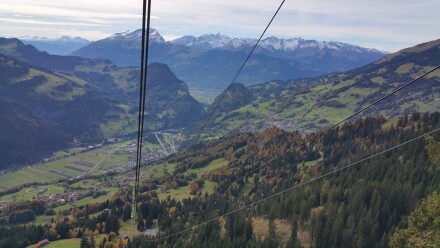 The Fanas cable car is operated on request only. During our 20 minute wait for the operator, I source a plug for TW560. I find a construction site just a few metres above the valley station of our cable car and after chatting with the Italian construction crew, am allowed to charge my TWIKE from a juicy red 32A plug. At precisely 1300, the bearded cable car operator arrived and opened the ticket booth. 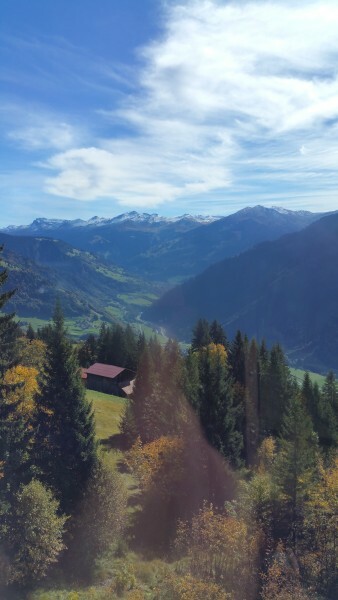 After parting with 32 CHF, we were among the first to be transported up the mountain during the 12 Minute ascent to the top. The view gets better by the minute! At the top, we’re greeted by a stunning panorama with the Calanda, Chur’s main mountain, taking center stage. 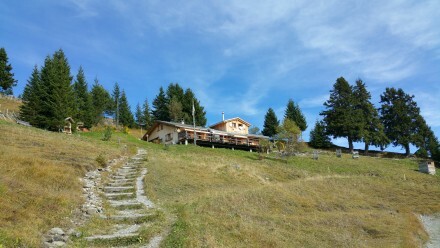 A few last steps remain between the mountain station and our Alp-restaurant. The menu relies on local produce only. 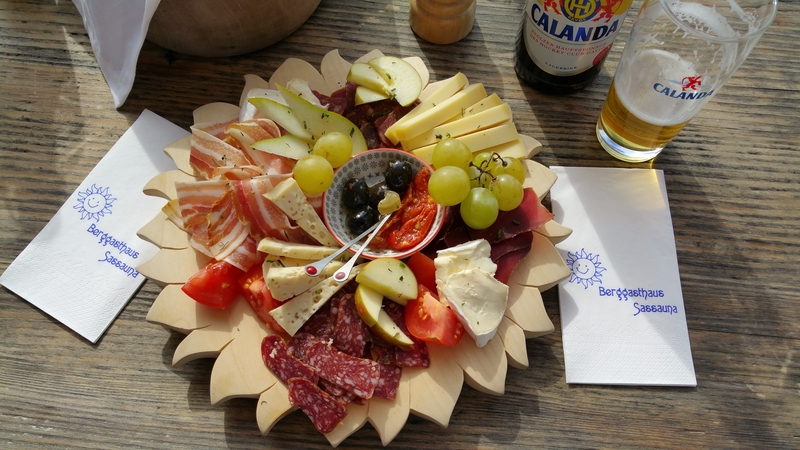 We order local beer and a meat and cheese platter. Oliver and I both sit in the sun, relaxing, muttering ‘wow, this is just beautiful’ over and over again. 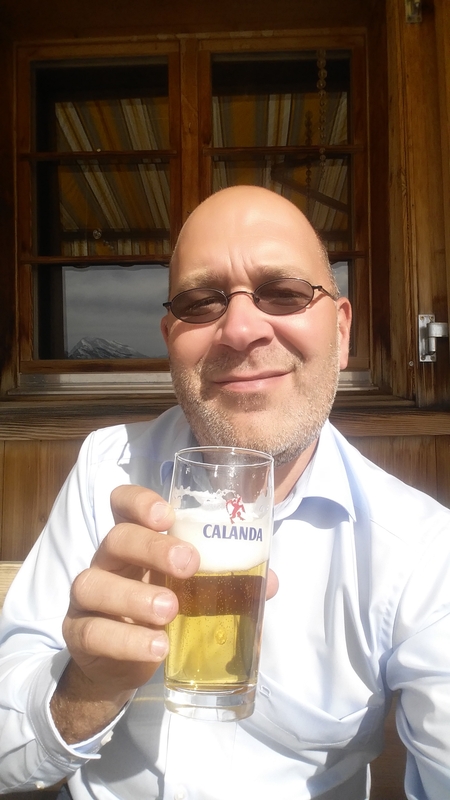 We get our beers: Calanda. 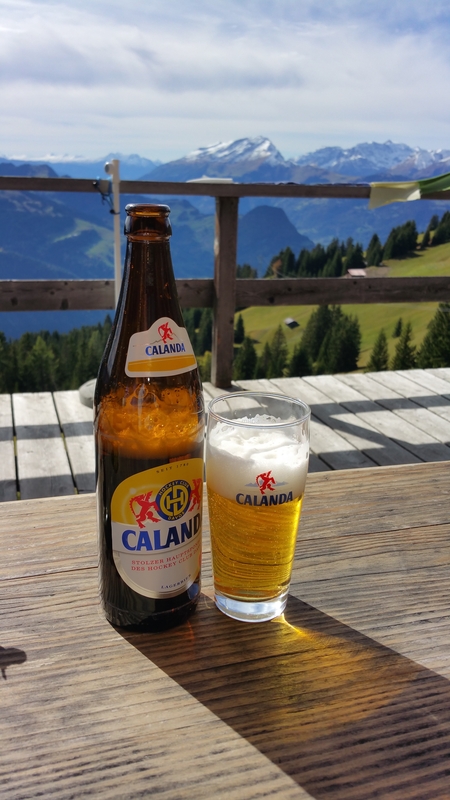 No other beer makes sense here, in direct view of the Calanda. An interesting feature of the calanda bottle is its volume: No european standard 0.5 litre bottle. You get 0.58 litres! 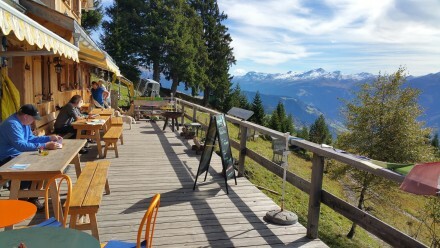 After finishing our food, we pay-up and walk around for a while – just a few hundred metres away around the hill new vistas await us. We both want to be back home before it’s dark, see our families and get ready for a busy week ahead, with one day’s worth of work waiting for us already. 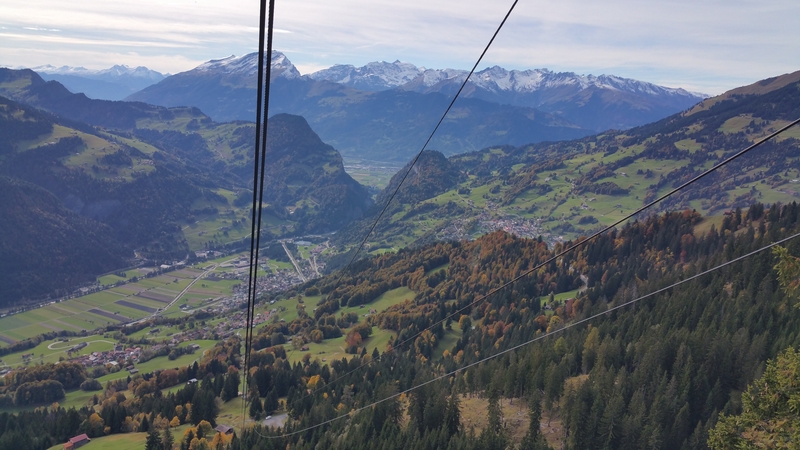 This is why we head back to the cable car, ring the operator and wait. On our way back down we spy TW560 still parked at the construction site, waiting for us, fully charged. We thank the cable car operator for his work and head back to TW560. It is fully charged but this time has a semi-friendly message from the building’s future owner: see for yourself. Click the image to see the question! I called the number. 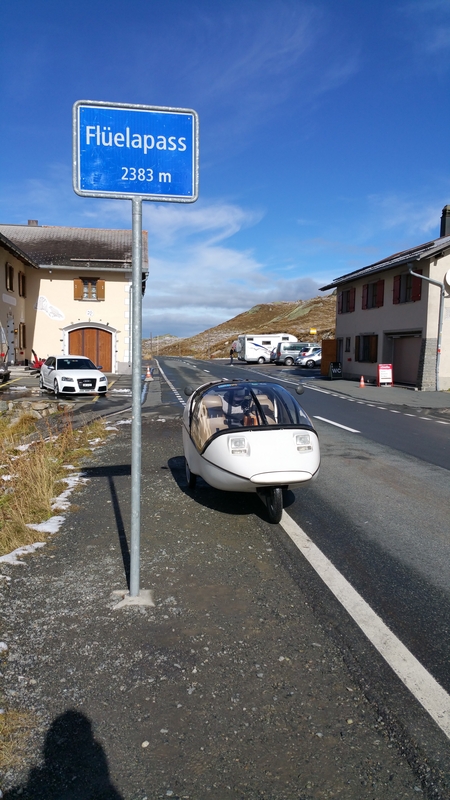 The person on the other end was very friendly and told me that he had been very surprised to have been chosen to sponsor the energy costs for this vehicle! 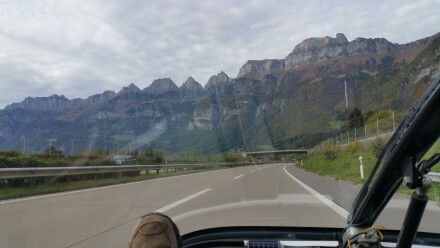 I explained to him that it was no more than 0.50 CHF worth of energy that we had consumed. 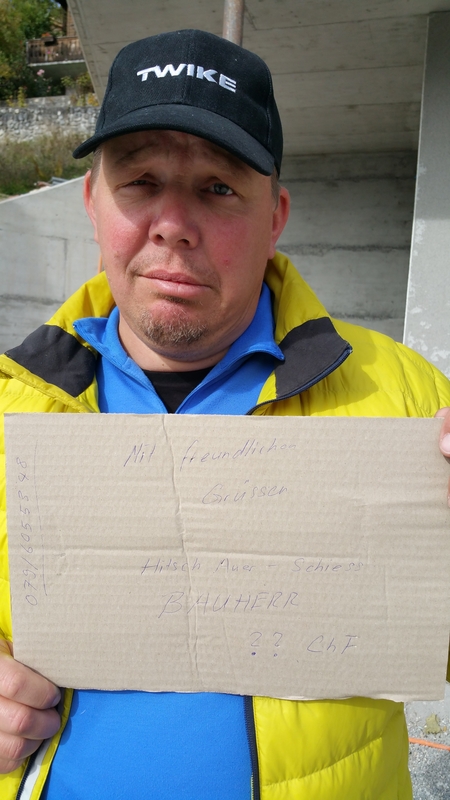 He told me to leave a ‘donation’ which he would add to his next donation to the MSF. 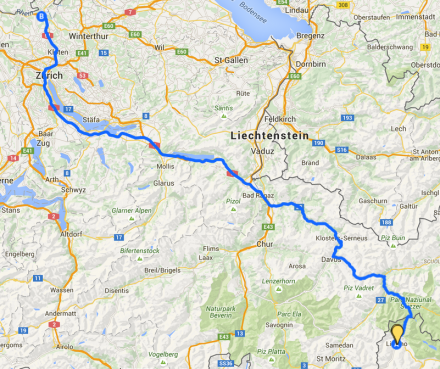 We leave CHF 5 for a good cause and head back down the hill towards the Rhine valley on our way back to Zurich. The Churfirsten – always a nice sight! 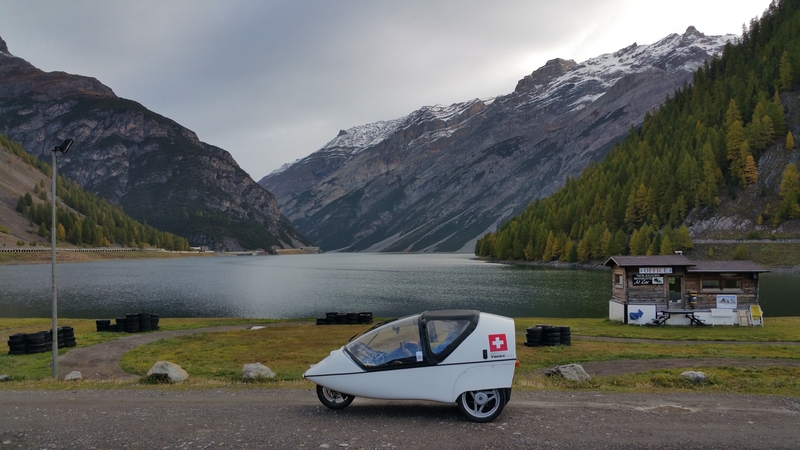 The last three days also showed us both as a TWIKE team work really well – We’re definitely going to be travelling together again in the future. P.S. 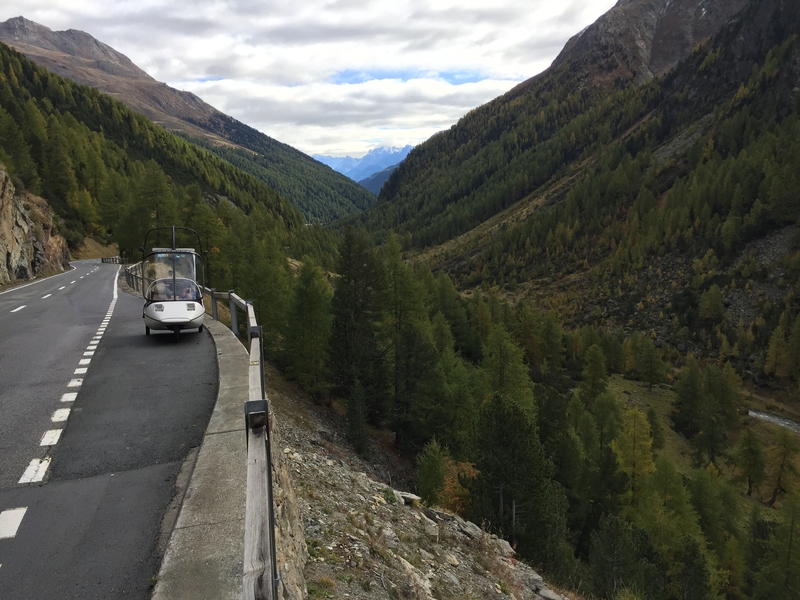 : This will be one of the last trips to the alps this year – it’s getting colder by the day and many higher alpine passes are closed already for the winter.